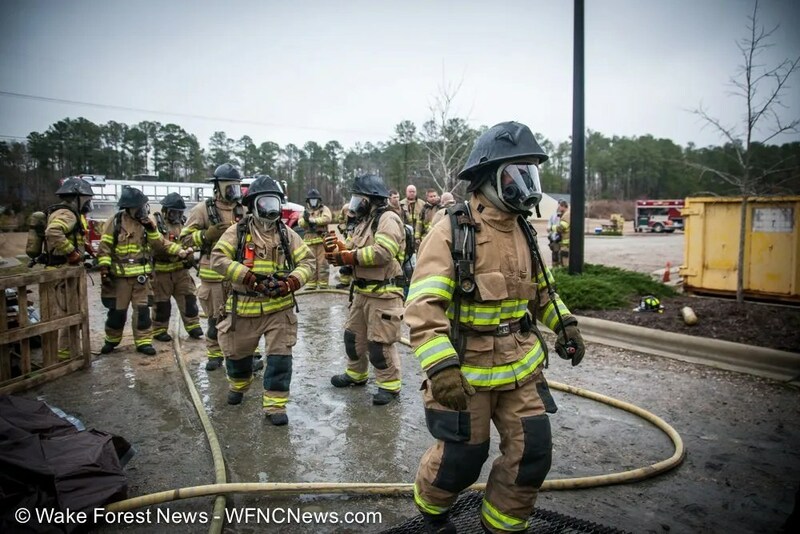 Yesterday and today the Wake Forest Fire Department, and their invited guests, Stony Hill Fire Department and Youngsville Fire Department, took part in hands-on training in recognizing and surviving deadly fire flashovers. Be sure to watch the video at the bottom of this story to see what it was like inside the flashover simulator. A flashover happens for a number of reasons but basically it’s when the combustible gas trapped at the top of a burning room, ignites and creates heat so hot it can melt the facemask of a firefighter and/or kill a standing firefighter in seconds. Even the tough turnout gear worn by firefighters can’t survive more than 15 seconds in intense flashover heat. Fire blasts out the doors of the flashover simulator as Wake Forest firefighters sit inside. And while there are about 13% fewer house fires these days there are about 30% more house fires that have this deadly flashover condition that kills during a structure fire. The primary reason is because of the abundance of the increase in plastic and synthetic materials inside of tightly constructed homes these days. Those materials produce 500 times more smoke than wood alone does. Plastic also burns significantly hotter than wood which increases the dangers. Wake Forest firefighters with their instructors get the fire rolling inside the flashover simulator and wait for conditions to be perfect. These plastic and synthetic materials produce a dense black smoke which is really unburned fuel and it becomes trapped inside structures and can hide the location of a roaring fire. Those gases can easily ignite from trapped thermal radiation as the walls and contents reach high temperatures or with the introduction of oxygen when a door or window is opened. The classroom and practical training sessions gave local firefighters insight into the deadly flashover. Wake Forest firefighters enter the flashover simulator wearing their turnout gear, face masks, and breathing air strapped to their backs. But that’s not the only reason why firefighters die from these fire related events. Better personal protection equipment also leads firefighters to go deeper in a bad situation thinking they are safe. Faster 911 notification and dispatch of fire departments also leads firefighters into trouble by arriving sooner while the most dangerous conditions exist. In firefighting a lot of things can kill you but one of the things you don’t want to die from is a flashover. Instructors described it as a painful death and experienced firefighters who have been injured but lived through flashovers describe it as the worst pain and panic they’ve ever experienced. The Wake Forest Fire Department training took place in the flashover simulator which was brought in from Gaston College. 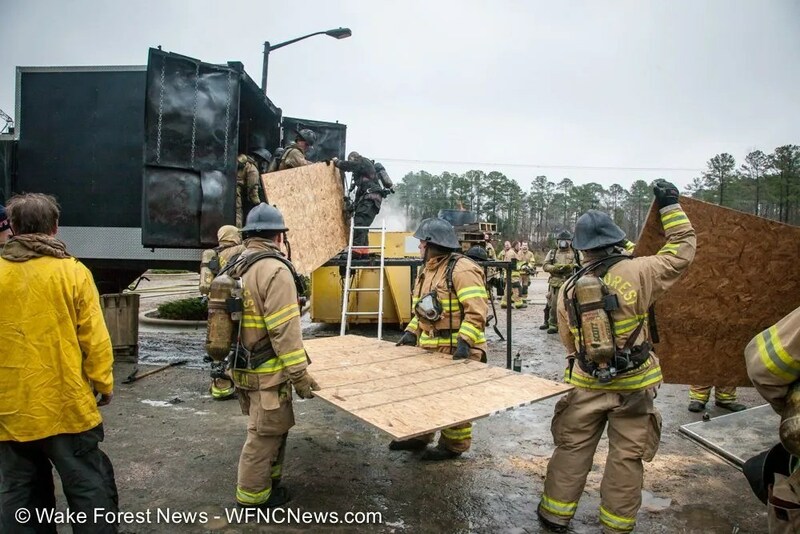 Wake Forest firefighters held load the five sheets of OSB that will be burned during the flashover training session. 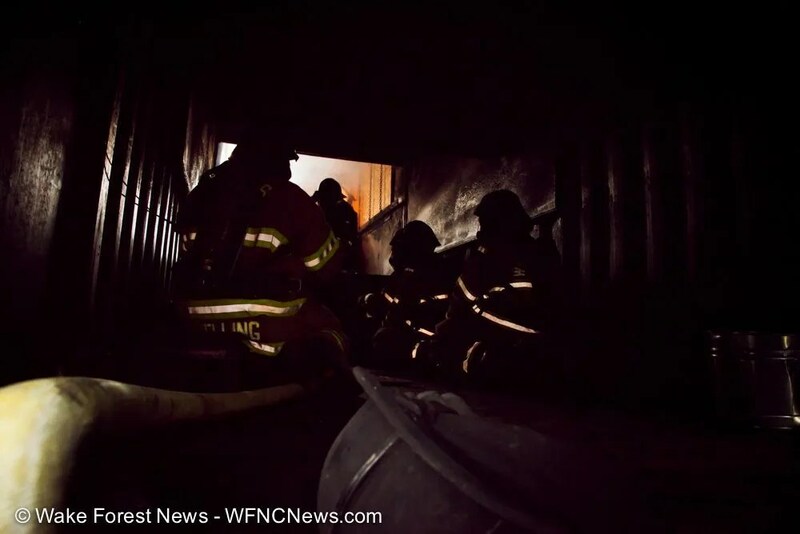 Led by instructors and experienced firefighters Scott Hardin and Jared McCarnin the firefighters experienced actual flashovers first-hand as they sat inside of what looked like a modified shipping container specially designed for this kind of training. What students learned in class was there are ways to survive these events by first reading the smoke and recognizing when they will occur, or by getting down on the floor and getting out of there, fast. Sometimes that even means diving head first out a window. In the video below you will see what firefighters in the flashover simulator saw and heard. By the end of the training the students emerged warmer and with more knowledge about flashovers that can help save the lives of local residents in a fire and firefighters trying to save them. 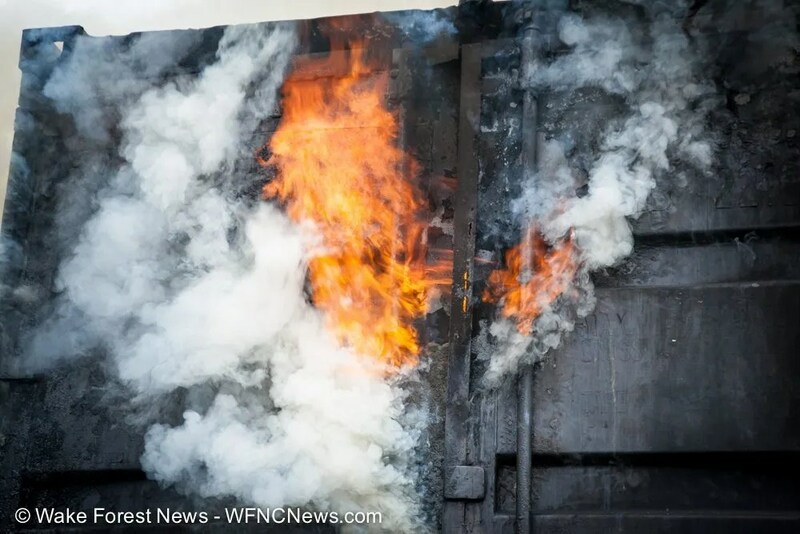 The training provided by the Gaston College flashover simulator for the Wake Forest Fire Department appears to be invaluable and something every fire department should regularly go through. In fact even Wake Forest Chief Early took part in the training, recognizing the importance of this practical experience. Firefighters clean out the simulator to prepare for the next group of students. Fire rushes out the backdoors of the simulator. Fire and smoke escpae from the training container. Hot flames burst upwards from flashover simulator. The flashover simulator is prepped. Wood is loaded in the simulator for the next class. Only five sheets of wood are needed to create the intensive fire and smoke. Wake Forest firefighters help load the five sheets of OSB that will be burned during the flashover training session. Wake Forest firefighters wait their turn in the simulator. Students spend time in the classroom learning about the dangers of flashovers before they head into the fire for training. glad to see they finally cleaned up that area beside the underpass…still more to do though, but it looks better..